How to export/import the Folders/Reports from one envirornment to another.. I am sure, in Answers/Dashboards, most of OBIEE developers may face a common issue of copying all their objects from one folder to another folder, one environment to another environment (in the developing stage) etc. If you got the access to the system in which the Catalog is stored then, these actions are very easy. But how to do it in Dashboard catalog. OBIEE 11g came up with a solution for this problem. Archive and Unarchive. In Archive you can archive (export) a folder with diff objects to the local file system. The archived file can be Unarchived (imported) into another folder. So simple… isn’t it? I am implementing Archive and Unarchive process using two instances one is ‘‘eld15’’ and second one is ‘‘obiee2’’ instances. 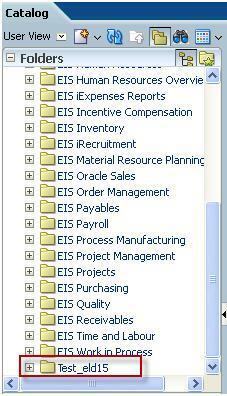 Here ‘‘eld15’’ instances ‘Shared Folder’ having ‘Test_eld15’ reports folder. 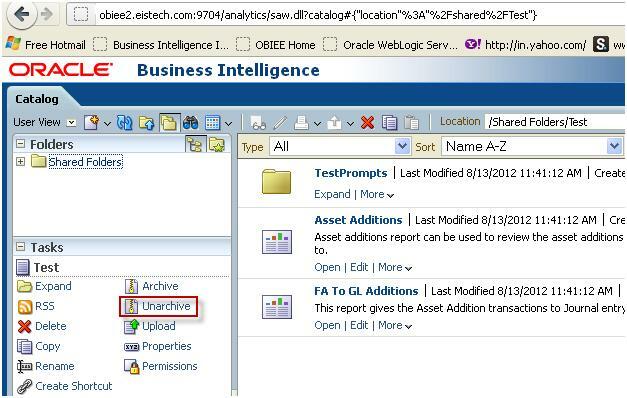 Using Archive/Unarchive process ‘Test_eld15’ folder will move to ‘‘obiee2’’ instances under ‘Shared Folder’. 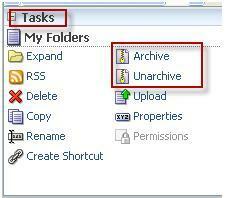 Archive and Unarchive options are available under ‘Tasks’ option. In Archive you can archive (export) a folder with diff objects to the local file system. Select the ‘Test_eld15’ folder and now, click on the Archive link, which will open a dialog box with some options for the archiving. Check the two boxes. After clicking OK button, a dialog box will appear asking where the catalog to be saved. Select the desired location and save the file. This archive file saved into a Downloads. Select the ‘Shared folder’ into which the archived (exported) filed needs to be Unarchived (imported). We are going to unarchive the ‘Test_eld15’ file will be created in the shared folder. 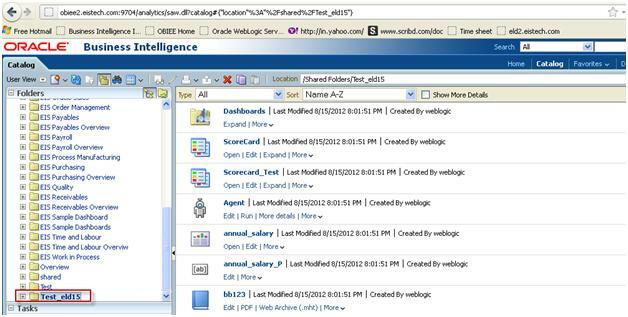 Then click on the Unarchive link in ‘obiee2’ instances. The Unarchive dialog box will appear which allows us to select the file which needs to be Unarchived into the currently selected folder ( in our example, its ‘Test_eld15’). Click OK. In this Unarchive window having three option. Each one having multiple options. Archive file: Browse the appropriate archive file name (‘Test_eld15’). Force — Pastes all files, overwriting even those that have the read-only attribute set. Old — Pastes all possible files, but does not overwrite any existing files unless they are older than the source. None — Pastes all possible files, but does not overwrite any existing files. Preserve — Preserves the object’s permissions (ACL) as it was in the original, mapping accounts as necessary. Once it is successful click on “Ok” and a ‘Test_eld15’ file will be created in the shared folder shown. 3 Responses to How to export/import the Folders/Reports from one envirornment to another..